Thousands of apps for your Mac. With the Mac App Store right on your Mac, you can find apps for studying, doing assignments, and getting organized. And, of course, for playing games. The best part? You can download and start using them right away. You can also use your Back to School Card on the iTunes Store, the App Store, and the iBookstore. *Buy a qualifying Mac from Apple or a participating Apple Authorized Campus Store from June 16, 2011, through September 20, 2011, and receive a $100 Back to School Card for use on the Mac App Store, the iTunes Store, the App Store, and the iBookstore. 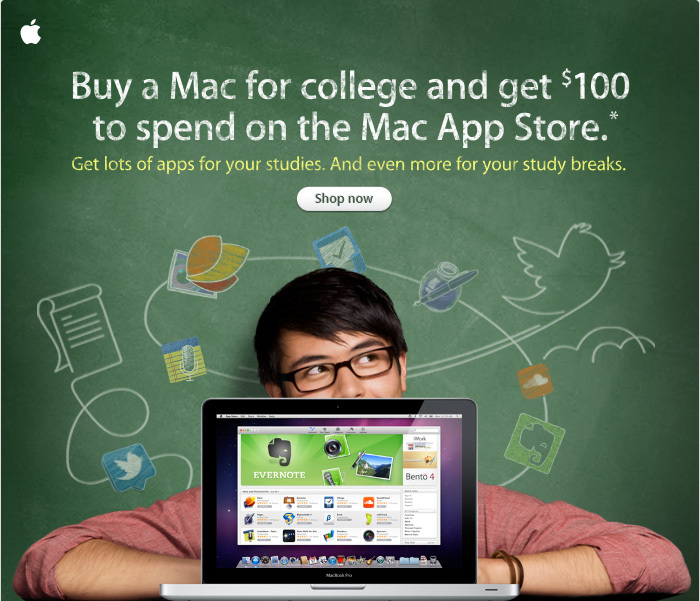 Qualifying Mac must be purchased using Apple’s Education Individual Pricing. If the qualifying Mac is returned, your refund may be reduced by the full amount of the Back to School Card. Terms and conditions apply. Visit www.apple.com/backtoschool for full details. Not all Apple products qualify for education pricing. **Apple offers special education pricing on Apple computers, software, and select third-party products to College Students, Parents buying for a College Student, or Teachers, Administrators, and Staff at all grade levels. Quantity limits apply. See terms and conditions. The Mac App Store is available only to persons age 13 or older in the U.S. and many other countries; see www.apple.com/support/mac/app-store/ww/ for a list of countries. Requires compatible hardware and software and Internet access; broadband recommended (fees may apply). Terms apply. TM and copyright © 2011 Apple Inc. 1 Infinite Loop, MS 96-DM, Cupertino, CA 95014. If you prefer not to receive commercial email from Apple, or if you’ve changed your email address, please click here.